Welcome to the Karl Penton Gallery, We hope you enjoy your visit. We are so glad you found us! Take a look at our collection online or visit our store in Halifax. We hope we can add some color to your home or work-space. On the East Coast these colors would help guide a fisherman home, each reflecting a part of their vibrant personalities! This is the first piece Karl created when he began painting again. Representing the past but also the beginnings of something new. Considered one of Karl's signature pieces, his whimsical painting captures the joy East Coasters feel about hanging out their clothes. If only we could hang our homes like quilts for that fresh clean sea breeze! This door with the old fashioned latch and the long hinges is the type of door referred to as a "storm door". Keefe's Stage in Tilting , Fogo Island is known as the most photographed fishing stage in Canada. The place where "view" was invented. Take a walk in this majestic place and you will know why Karl wanted to paint this! The end of a Church Pew from the first Church on Fogo Island. It leaned against a building on the Island for years, now it leans up against the wall in Karl's studio. Capturing the fun and bright colors of the East Coast of Canada, this painting began as a quick sketch but captured the imagination of many. From the "Door Series" this is a doorway that is not often seen anymore. The moldings and the light box above are now a rarity. This painting is a tribute to all of the people you lean on throughout your life. The line of quilts and pillowcases represent all of the people with whom you surround yourself! This is the very first painting from the "Door Series." The contrasting Red and Yellow colors along with a modern door on an "not so young" building caught Karl"s eye the second he saw it. The iconic piece has become the Gallery's logo. The title says it all! Many of the families who thrived and built communities during the fishery days, were living on the edge of the world! Once known as "poor man's food", the lobster is now quite the delicacy. The "TALE" part of this title is a tip of the hat to stories that were told on-shore by fishermen to very trusting listeners. The NEWTOWN...with lots of old charm. This one steps back in time to a magical lil' wonderous place. Drive past this beautiful property in Port Dufferin, Nova Scotia and you cannot help but pull over and gaze at what is before you. The second Karl saw this, he pictured a painting. Grole is a now re-settled town in Hermitage Bay, NL. 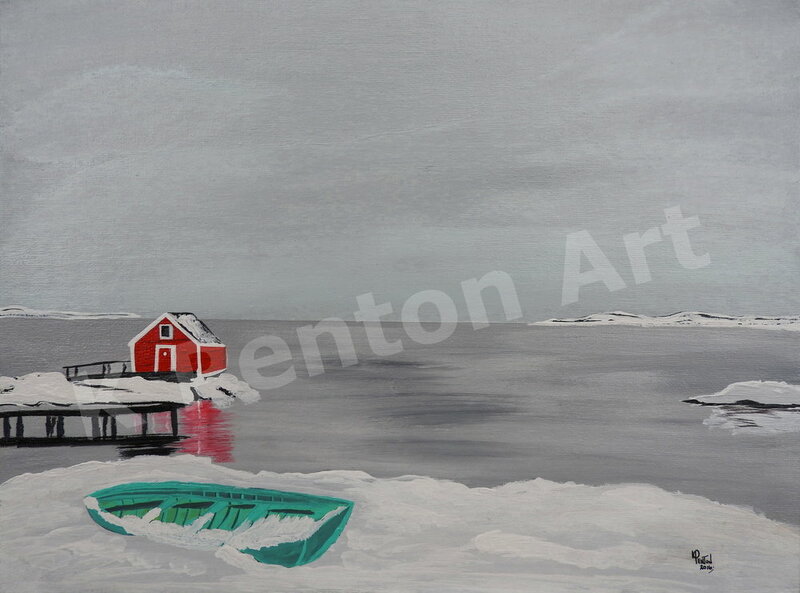 This painting captures Mr. Taylor taking his boat onto the water beside his boathouse. On the same building and right next to "Leave the light on". A very old door right next to a very modern door. Sherbrooke Village, Nova Scotia: While there you are able to step back in time and see the heritage of the East Coast brought to life again! Some of Karl's older siblings and cousins went to this one room school on the south side of Joe Batt's Arm on Fogo Island, NL. Before the discovery of oil, there was Cod. Dangerous conditions did not deter the brave souls that made their way out to sea to make a living from it. Remembering a time when you checked in on and visited your neighbors. Borrowed a cup of sugar,, beating a path to each others doors.